Who doesn’t love to sit down for a nice home-cooked meal? At the same time, we’re all juggling multiple responsibilities which compete for our attention and can cut into time spent preparing food all too easily. What’s simple, nutritious and delicious—-and can be prepared quickly and easily for those of us who are always on the go? Here’s some of my go-to meals for when time is at a premium and spending hours in the kitchen isn’t even an option—-but I’d rather avoid fast food takeout or bland-tasting frozen meals. 1. Curried beef. The simple version: brown some beef strips. Add curry sauce. Done. A bit of coconut milk helps with variety, and you can also substitute the beef strips with chicken strips, though this obviously requires some chopping. Same with adding onions and garlic—it’s optional. It’s amazing how good such an easy meal tastes. 2. A protein-rich salad. I buy mixed greens, so there’s already an assortment, and add cherry tomatoes—which don’t even need cutting. Then, I’ll add canned salmon or tuna (or even hard-boiled eggs, if I’ve prepared some ahead of time.) A tablespoon of oil and balsamic vinegar rounds this out nicely. 3. Smoothies. A great summer treat. I usually just blend frozen or fresh fruit with some kind of liquid (coconut milk works great, but is just one option) and add protein powder, raw cacao powder, green powder or whatever else I have on hand. 4. 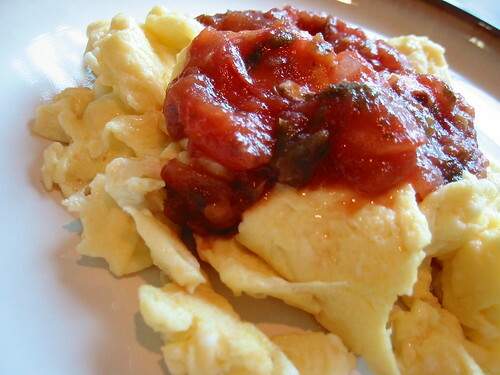 Eggs and salsa for breakfast (or whenever). I just scramble them together for a very quick breakfast when grabbing a banana just won’t cut it. But you can also just make eggs however you like them, and add a dollop of salsa on top. Adding sliced avocado makes this taste amazing. 5. Sausage or burgers on the Foreman grill. Quick and easy. Boiling or steaming some quickly heating vegetables is also an option, but sometimes I’ll just add raw mixed greens and some sauerkraut on the side. What are your favorite options for quick Paleo meals?